Which and how many different bird species can people across the globe spot in a single day? This question will be answered on May 4, 2019 when the 5th edition of the Global Big Day kicks off in over 170 countries. And you can be part of it no matter where you are. 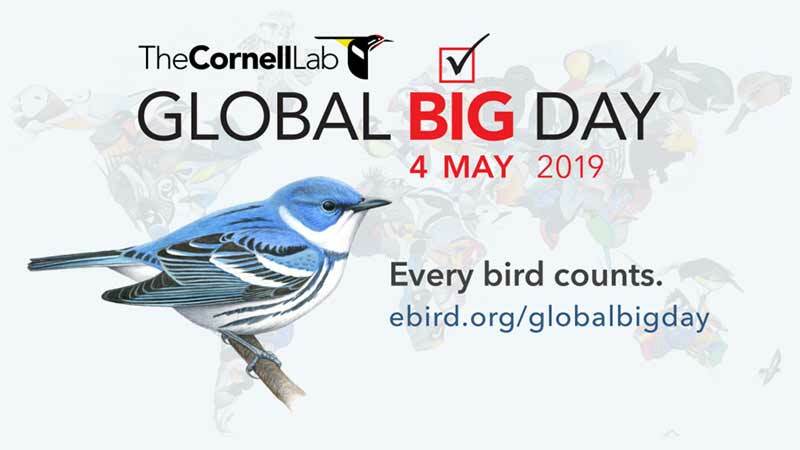 Global Big Day is an international birding competition organized by the Laboratory of Ornithology of the Cornell University in the US and eBird, the world’s largest biodiversity-related citizen science project. In Peru, it is promoted among others by the Center of Ornithology and Biodiversity (CORBIDI) and the National Service of Natural Protected Areas (SERNANP). On Global Big Day birdwatchers and nature lovers, young and old and everyone who wants to support global bird conservation head out to spot as many birds as possible for the advancement of science, enter their sightings via the eBird website or mobile app into the eBird database and at the end of the day see who came across the most bird species in a single day. You don’t have to be a bird expert or spend the whole day. Everyone is invited to participate for as long as wanted. During last year’s Global Big Day more than 70% of the world’s bird species (to be exact a staggering 7,025) were spotted in a single day, with sightings coming in from 28,000 eBirders spread across 170 countries. While birding pros in Peru might head to areas known to have big bird populations such as Manu National Park, the Tambopata National Reserve, the Paracas National Reserve or the El Sira Community Reserve, every single registered bird counts even the one in your back yard or local park. In 2015 and 2016 Peru was the Global Big Day World Champion with 1185 and 1241 different bird species recorded by participants. In 2017 and 2018 however the country was defeated despite its huge biodiversity by Colombia. So, get out your binoculars, invite your friends and head out. And no matter what you do, enjoy the birds, share your sightings on eBird and have lots of fun.